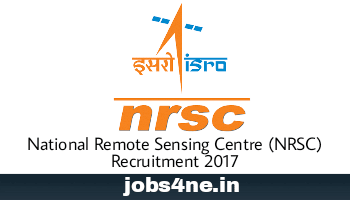 NRSC Recruitment 2017- 74 Nos. Technician, Draughtsman, Technical Asstt. and Scientific Asstt. : Last Date 10-06-2017. - Jobs4NE : Jobs in Assam and North East India. NRSC Recruitment 2017- 74 Nos. Technician, Draughtsman, Technical Asstt. and Scientific Asstt. : Last Date 10-06-2017. National Remote Sensing Centre (NRSC) is a Centre of Indian Space Research Organisation (ISRO), invites online applications to fill up the below mentioned 74 Nos. posts of Technician - B, Draughtsman - B, Technical Assistant and Scientific Assistant. Starting Date of Online application: 20-05-2017. Last Date of Online application: 10-06-2017. Total no. of posts: 74 Nos. 1. Technician – B (Electronic Mechanic): 22 Posts. 2. Technician – B (Electrician): 14 Posts. 3. Technician – B (Fitter): 2 Posts. 4. Technician – B (Instrument Mechanic): 4 Posts. 5. Technician – B (Laboratory Assistant Chemical): 1 Post. 6. Technician – B (Machinist): 6 Posts. 7. Technician – B (Motor Mechanic): 2 Posts. 8. Technician – B (Plumber): 1 Post. 9. Technician – B (Refrigeration & Air – Conditioning): 4 Posts. 10. Draughtsman – B (Civil): 6 Posts. 11. Technical Assistant: 1 Post. 12. Technical Assistant: 1 Post. 13. Scientific Assistant: 2 Posts. 14. Scientific Assistant: 5 Posts. 15. Scientific Assistant: 3 Posts. Age Limit: 18 - 35 Years as on 10-06-2017. Upper age relaxation 05 Years for SC/ ST candidates and 03 Years for OBC candidates. 1. Technician - B: SSLC/ SSC pass. ITI/ NTC/ NAC in concerned trade. 2. Draughtsman - B: SSLC/ SSC pass. ITI/ NTC/ NAC in Draughtsman - Civil Trade. 3. Technical Assistant (TA1): First Class Diploma in Civil Engineering. 4. Technical Assistant (TA2): First Class Diploma in Electrical & Electronics Engineering. 5. Scientific Assistant (SA1): First Class B.Sc. Degree in Chemistry. 6. Scientific Assistant (SA2, SA3): First Class B.Sc. Degree with a combination of Mathematics, Statistics, Computer Science. (a) Technical Assistant & Scientific Assistant: Rs. 44900/- Level 7. (b) Technician B & Draughtsman-B: Rs. 21700/- Level 3. How to Apply: Eligible and interested candidates may apply Online through NRSC official website: www.nrsc.gov.in.